What is equity for adjuncts? Will it ever become a reality? I am currently 'celebrating' my 50th years of adjuncting. Why would I subject myself to such exploitation for such a long period of time? Well for the first 35 years I had a 'real' job in the private sector, not teaching, which allowed me to raise 2 sons and give me and my wife a good lifestyle. During that period I taught a couple of courses a semester at night or on Saturday and had very little interest in pay, benefits, support, governance, etc.? Once I realized my real passion was in teaching I left my other job and became a professional adjunct, or as we call ourselves in New Jersey - 'Roads Scholars' - traveling the state between schools in order to earn a living. Then came the wake up call! Could the Affordable Care Act Help Cure HigherEd of Adjunctivitis? NFM VP Matt Williams explores the implications of the Affordable Care Act for Adjuncts at AkronAdjunct, reposted below in full. The U.S. Supreme Court upheld healthcare reform today, and the decision promises to change the landscape of the healthcare industry in America. While much of the focus of the debate has been on the individual mandate, the employer mandate may have some surprising (and potentially positive) implications for the nation’s nearly 1 million adjunct faculty who often teach for poverty wages and are frequently denied access to employer sponsored health insurance. The controversial health care law includes an employer mandate that requires large employers (i.e., those with more than 50 full-time employees or full-time equivalents) to provide health insurance to its employees or pay a penalty. 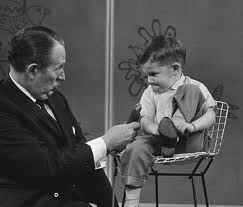 Does anyone out there have a working adjunct mentoring program in place in their College? We have been trying to get one in my Community College but have met with resistance by our Vice President for Academic Affairs (VPAA). When I first mentioned this to the VPAA last semester she responded by saying that it might be a good idea for full time faculty to mentor new adjuncts!!! That shows how little the administration understands us. I told her that our proposal was for seasoned adjuncts to mentor new adjuncts. After all who knows better? After hearing many stories from new adjuncts who were hired, given a generic syllabus, and told to teach, without out any further direction, our adjunct local decided that we needed to step in and help. We created a model based on mentoring programs in other Colleges and Universities. Our plan called for a structured program of orientation, mentoring, observation, and evaluation. I just feel I need to comment on the AAUP report regarding Contingent Faculty governance. Professors Say the Darndest Things! All higher education faculty need to come together in sincere and forthright dialogue. ...news & links about #ContingentFaculty, #academiclabor & #organizing in #highered. To subscribe to regular Updates, email joeberry@igc.org. More about Joe Berry. Updates are also archived at chicagococal.org. Follow COCAL International on Facebook. 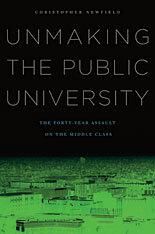 Chris Newfield at Remaking the University explains who really controls "public" universities or "Yes Virginia, there really is a ruling class, and you are not in it." More from Chris and Remaking about recent Bad Day(s) at UVa here and an all-too relevant /UCLA biz school/privatization background story here. …and as often as necessary until you read it, stop preaching to the choir and find ways to share it with non-academic stakeholders... and maybe academic ones in denial. You've seen the first round of the articles in higher ed media. You've read, added trenchant or glowing comments to articles and blogs. Guess what? Just reading articles, pro or/and con, is no different than getting by with the Cliff Notes version. If you haven't seen actual results, this report from the CAW website will be of interest, if depressing and hardly surprising, and comes highly recommended as a research documentation of contingent faculty conditions of employment. ...news & links about #ContingentFaculty & #organizing in #highered. To subscribe to regular Updates, email joeberry@igc.org. More about Joe Berry. Updates are also archived at chicagococal.org. Follow COCAL International on Facebook. "We wanted to remind you that the COCAL X Mexico (English) is taking place on 8/9/2012 - 8/12/2012 at Avenida Universidad 3000, Ciudad Universitaria, 04510 Delegación Coyoacán, Ciudad de México, DF. We expect the available registrations to fill up quickly. So, we would like to offer you the opportunity to reserve your spot at a reduced early bird rate! To RSVP, click here . We look forward to hearing from you! Thank you, David Milroy." …as the #UVA Board of Visitors might update it, by Kieran Healy. Pre-Rally for Honor reading (along with originals) or seemly substitute for those of us unable to attend. The situation at historical University of Virginia (the only university in the United States to be designated a World Heritage Site by UNESCO) shares more than a few parallels with a different but equally alarming situation at a new university, Texas A&M University - San Antonio (established 2009). Adjunct professor Bradford and university president Sullivan, both supporting Jeffersonian ideals, both struck down. The message and its warning are the same. The ax of the corporate university hews high and low, not hesitating to take out those who resist its mission and speak out. When in the Course of human events, it becomes necessary for a Board to dissolve the administrative bands which have connected a President with a University, and to assume for themselves the powers of the earth, the separate and equal station to which the Laws of Nature and the Bond Market entitle them, it is best to do it secretly, quickly, and in the middle of the night. As reposted from Portside Labor, which "aims to provide material of interest to people on the left that will help them to interpret the world and to change it." The National Labor Relations Board today made public a webpage that describes the rights of employees to act together for their mutual aid and protection, even if they are not in a union. affecting other employees; a paramedic fired after posting work-related grievances on Facebook; and poultry workers fired after discussing their grievances with a newspaper reporter. The right to engage in certain types of concerted activity was written into the original 1935 National Labor Relations Act's Section 7.... That right has been upheld in numerous decisions by appellate courts and by the U.S. Supreme Court over the years. Non-union concerted activity accounts for more than 5% of the agency's recent caseload. "A right only has value when people know it exists," said NLRB Chairman Mark Gaston Pearce. "We think the right to engage in protected concerted activity is one of the best kept secrets of the National Labor Relations Act, and more important than ever in these difficult economic times. Our hope is that other workers will see themselves in the cases we've selected and understand that they do have strength in numbers." Whether or not concerted activity is protected depends on the facts of the case. If you have questions, please contact an Information Officer at your nearest NLRB Regional Office, which you can find on this page or by calling 1-866-667-NLRB. as posted by George Siemens at elearnspace, June 16, 2012. I was going to ramble today or be more purposeful, issuing reminders and otherwise exhorting one and sundry (July 1 Stafford deadline, petitions, UNL's EDAD adjunct survey on evals, Duquesne, TAMUSA, etc). I may still do one or both, but this caught my eye and looked like something I could turn around much easier than the baggy monster sitting in drafts. I'm still deferring final posts for #change11 (digital identities, it's a wrap so what's the takeaway). George Siemens introduces the next open online course (aka MOOC though some people don't like the term) that we are participating in (by 'we' I mean George and myself, Dave Cormier and Bonnie Stewart, the Gates Foundation, EDUCAUSE, Desire2Learn, UBC, SOLAR, CETI, and a spare kitchen sink we found by the roadside). It will be short and intense, quite unlike our previous effort. 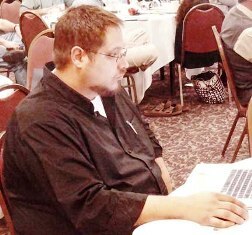 ...news & links about #ContingentFaculty & #organizing in #highered. To subscribe to regular Updates, email joeberry@igc.org. More about Joe Berry. Updates are also archived at chicagococal.org. Follow COCAL International on Facebook. As a personal favor, Joe asks your to read and consider an appeal from a friend and fellow activist. Class War University is new site collecting articles on the struggle in higher ed worldwide. "Yo soy 132: Student-led Uprising," the most recent post on the site, is an interesting interview with a professor at Univ. Metro in Mexico City about the current student movement, its history and prospects. Although the only "international" story, the blogroll on the right sidebar shows a good international selection. For more on global higher ed, see the International Student Movement (ISM) ~ "one world, one struggle" ~ website. 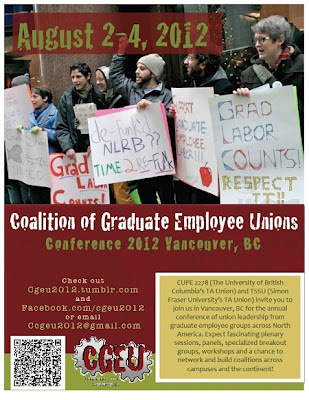 Coalition of Graduate Employee Unions (CGEU) Conference, Vancouver, August 2-4, 2012, also on Facebook. "The extraordinary student mobilization in Quebec has already sustained the longest and largest student strike in the history of North America, and it has already organized the single biggest act of civil disobedience in Canadian history. It is now rapidly growing into one of the most powerful and inventive anti-austerity campaigns anywhere in the world." Canadian highered blogger Melonie Fullick cautions about following US example of welcoming corporate influence on education research, asking, "Is the Gates Foundation 'galvanizing' education research?" 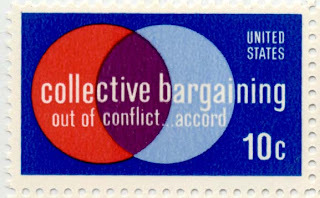 Collective bargaining rights and organizing have been *in the news more this year than usual, marking successes, failures, challenges but also, to be hoped, renewed interest and public support. Time to revisit basics, whether introduction or refresher. Addenda welcome: alternatives; questions; comments; alternate views. 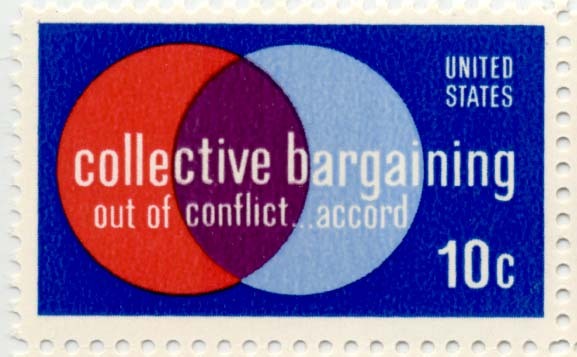 What is collective bargaining and why is it so important? Or better yet, why should you care? This question has come up frequently over the past year due to all the press surrounding recent actions by politicians who have passed or attempted to pass legislation to strip collective bargaining rights from public sector employees. What has been missing from the discussion is an actual explanation and understanding of the concept of collective bargaining. So let’s start with the basics. New Faculty Majority board member Ross Borden reminded us recently about the July 1 deadline for setting Stafford loan rates. Unless Congress acts before July 1, the fixed rate for all new subsidized Stafford loans will be doubled, from 3.4% to 6.8%. The House has already voted to keep the present rate, but by cutting funds to implement the Affordable Care Act. The Senate is divided between Republic and Democratic plans. Student loan debt is not just a student issue but an adjunct / contingent faculty issue as well. NFM is discussing an official letter writing or fax campaign, perhaps coordinated with other higher education advocacy groups or another campaign for maximum effect. In the meantime, we can each take action as individuals and urge others to join us. Join "tweetout" using the hashtag #dontdoublemyrate. Send and RT messages, petitions, updates, links. Tag your Senators, relevant committee members and @whitehouse so they get copies. Check here for an idea of tweet volume to date. Student associations are also participating. Sign Progressive Secretary letter, "Tell Washington to Keep Low Student Loan Interest Rates"
This letter supports the more than 130,000 students who delivered letters to Congressional leaders asking them to stop student loan interest rates from doubling from 3.4 to 6.8 percent. The letter will be sent to the Senate and to the President. Sign Change.org petition, "Tell Congress: Act before July 1st, don't let student loan interest rates double." I'll be adding more to the list between now and July 1 ~ send me yours to include ~ and I'll keep you updated on our campaign too. I've just learned that Keith Hoeller has been recognized for the Distinguished Faculty Awards at Green River Community College in Auburn, WA. This is the first time in 27 years that a Green River adjunct has been so recognized. On this list, we know Keith Hoeller as a dedicated activist and gifted writer, who publishes often, not just in the higher ed literature, but to the layman and the legislator as editorials in daily newspapers. But this award recognizes his teaching too. Keith's students have nominated him for this award on four occasions. Some of the comments in his nomination packet are from students and some from fellow faculty. It is gratifying to read how Keith's teaching has changed people's lives. As you may have noticed, board member and blogger (here and on Cringing Liberal Elite) Alan Trevithick has joined our NFM Facebook pit crew. Now to find the perfect NASCAR gear for him. Matt and Maria are on too but may not be as active. No gear for them. 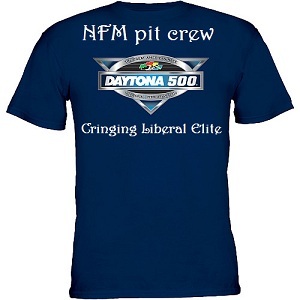 Tomorrow is a NFM board meeting / conference call 11am EDT. If anyone has last minute questions, email or post them as comments. Mostly, it's a catch up meeting, reports, structural/admin items. Tomorrow there will board news to announce. Now there is Foundation news: 501(3c) status approved. Member Forums will launch soon on the main site. We are also working on a membership drive. Since it's still in the formative stage, we'll asked for your opinions, ideas and reactions. Then expect to be reading a lot about that here and on our social media network. You may even come to think of the drive as needing a leash law. Why a membership drive? Easy. The stronger our membership base the more we can accomplish. …Michael Meranze rounds up #highered news, emphasis on California but relevant for all. Visit, read and bookmark or add Reclaiming the University, edited and with articles by Chris Newfield (author of Unmaking the University) and Michael Meranze, to your rss reader. In particular, take a look at Chris' June 6 piece, "Quality Public Higher Ed: From Udacity to Theory Y" (worth a post of its own). See also Bob Samuel's Changing Universities and Chris' "overflow" archives. It's a challenge keeping such similar blog names separate. Nor are these the only ones, a blog sub-genre for all practical purposes (and surely the topic for another post...). Last week, an over ambitious link lollapalooza feast assembled passed its "sell by" date before even reaching the drafts folder. Also in the pipes: a less time sensitive university themed Omnivore collection. Let us know about petitions we missed & other individual small steps. Help all these along by clicking down the list (the convenience of one stop clicking), taking notice, remembering them, sending them out on the social media of your choice, encouraging friends and colleagues to support them... starting your own. Need help? NEW this week: New Faculty Majority petitions Texas A&M University at San Antonio: Reinstate Fired Adjunct Professor Sissy Bradford, presented by NFM VP Matt Williams. Ana Maria Tamayo Fores' Adjunct Pay Petition and her monumental persistence inspired me to start this project. Robert Reich's June 6 post [and June 3 SF Gate column], entitled "Fairness is crucial to economic growth," makes a point that I remember Terry Knudsen of Spokane making at a legislative hearing in Olympia several years ago about improving the pay for adjunct faculty. "The only way the economy can grow and create more jobs is if prosperity is more widely shared... You want to know the real reason the economy crashed in 2008 and why recovery has been so anemic? Because so much of the nation's income and wealth have become concentrated at the top that America's vast middle class doesn't have enough purchasing power to keep the economy going." Clearly when adjunct faculty are provided poverty-level income and when they have no job security, they are hardly in a position to be be they kind of consumers who would revive the economy. I am writing on behalf of New Faculty Majority to protest San Antonio A & M's non-renewal of Adjunct Professor of Criminology Sissy Bradford, and to request your immediate intervention. Given the facts of the case, we are gravely concerned that it appears that in rescinding Professor Bradford’s courses at the same time that Professor Bradford has been speaking publicly about the incident involving the display of religious symbols on a new building entrance, and at the same time that she has objected to the university's handling of the threats against her, the University is engaging in retaliation against her. If true, this would violate the principles of academic freedom and freedom of speech that the university is committed to uphold. We urge you to reaffirm those essential principles by renewing Professor Bradford’s appointment for the fall semester. 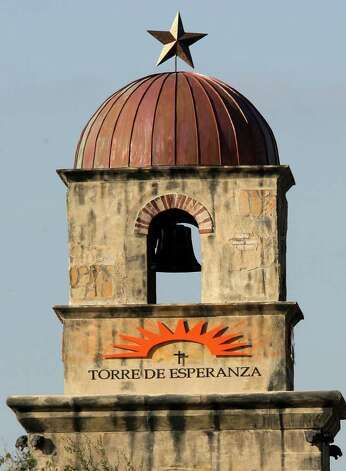 Adjunct fired at Texas A&M (Daily Mail, UK), a public university, as indirect result of objecting to cross displayed on top of university building (e.g. files complaint with ACLU that leads to removal of crosses and subsequent email threats that administration does not act on but reacts by taking away her fall courses for speaking out), as recently reported in Crosses, Threats and an Adjunct by Scott Jaschik (Inside HigherEd). See also Seth Kahn's impressive letter to San Antonio Texas A&M administration (Adjunct Project). Breaking update: she is now in communication with The Fire, which took an immediate interest in the case. Raritan Valley CC (NJ) adjunct union to protest at trustees meeting lack of progress in negotiations for contract. Duquesne, Pittsburgh, adjunct union (USW) to have NLRB representational election in June-July, by mail; post by USW organizer on organizing adjuncts, at the Adjunct Project. FYI, organizer also interviewed for 'Junct Rebellion film.